The trolleybus appeared later in Belgium. 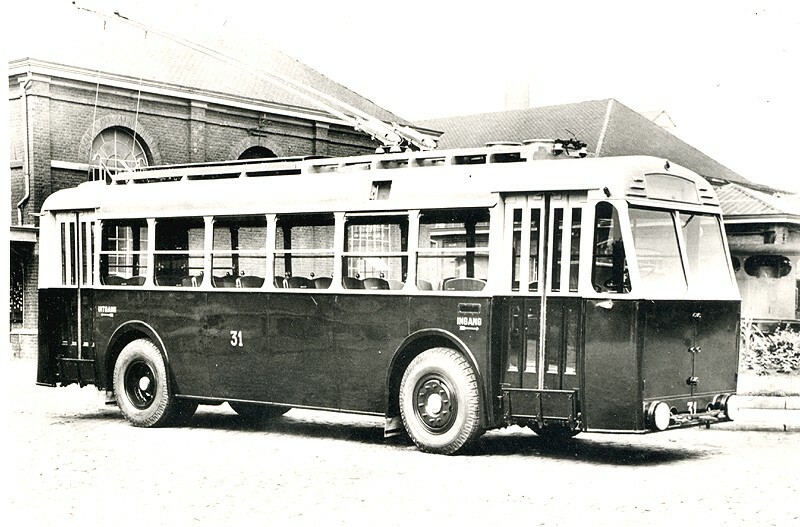 The first Belgian trolleybus line was opened only in 1929 in Antwerp, on the haven line. The first vehicles were converted buses. Trolleybus net of Antwerp became still greater before the Second World War, and the vehicles were still more modern. 3 lines existed in Antwerp and their history was similar to the Brussels' trolleybus line's history : bus technique evolved and buses replaced trolleybuses, already before the end of trolleybus service. At the last day of service - 30th march 1964 - only 2 electric vehicles rode. 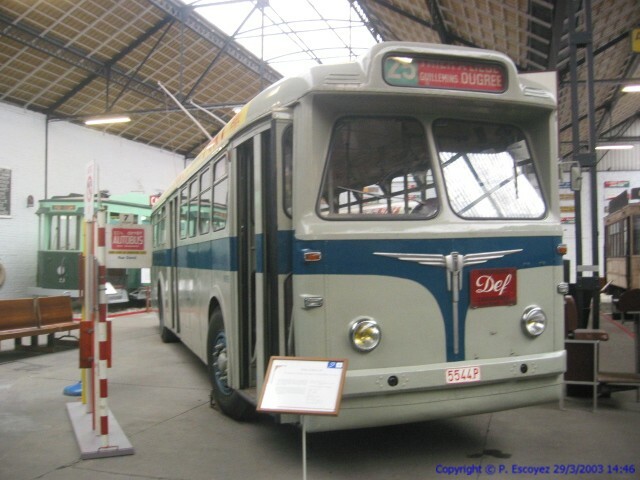 The trolleybus had success in Liege too. There, the first trolleybus line was opened a short time after Antwerp. At 10th august 1930 tramway line 20 (Cathédrale - Cointe) was converted into a trolleybus line, it will be the first of a great number of lines. The first vehicles had an english origin and the next vehicles were more modern and had a belgian origin. They were in service with the opening of new lines. With more than 20 lines had Liege the biggest trolleybus net in Belgium and in Europe in this time. The evolution and the flexibility of the bus will bring Liege's net into decline, trolleybuses dissapeared little by little and were replaced by 'benzin powered vehicles'. The last trolleybus left Liege's landscape in 1971, it was the end of more than 40 years of trolleybus service in the 'City of the Princes'. Trolleybus FN T54 at museum Natalis in Liège. This vehicle came from the last trolleybus generation in Liege, they rode till 1971. 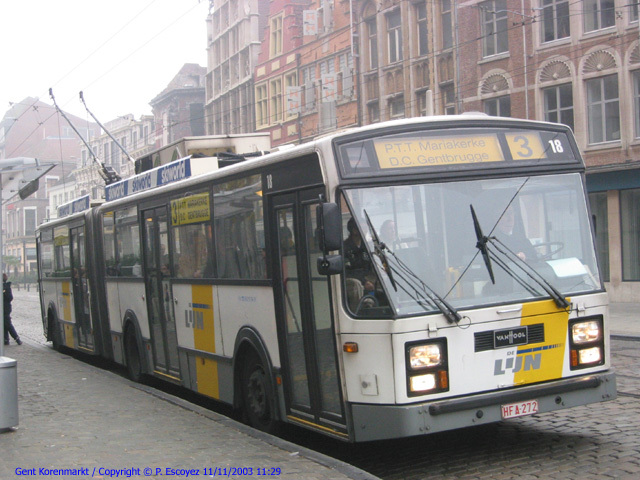 The trolleybus knew a second birth in Belgium : at 24th march 1989, a tramway line in Ghent (line 3 D.C. Gentbrugge - P.T.T. Mariakerke) was converted into a trolleybus line, because its profile was unsuitable for the bus, who rode on this line during already 20 years. Vehicles riding on this line are Van Hool AG280T. Ghent's Trolleybus on line 3.